Britannia on the Reverse of a Tin Farthing of William & Mary 1690. To counteract the forgery, in 1684, the production of farthings was changed from copper to tin with a copper center plug (and we think the recently introduced bi-metal £2 coins are an innovation!). This was done to alleviate the critical state of the Cornish tin mining industry, but also to recoup the King's losses, as Duke of Cornwall, because the price of tin had fallen from one shilling per pound in 1676 to less than eightpence. The tin coinage gave the Crown an even greater profit margin, of up to about 40%, and as a result there was even more concern about the potential for forgery. 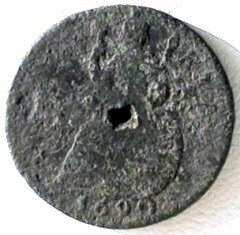 In addition to the copper plug as a security feature, the tin coins were produced with a lettered edge, which was applied before striking. There were several methods which could be used, but the process used for these tin coins was believed to be as follows. Two steel bars were used, one was screwed to a table, the other was movable and held by strong springs at a distance from the first bar slightly less than the diameter of the coin. A blank coin was inserted into the gap, and a crank handle moved the sprung bar so that the coin was forced to roll against and along it. The second bar carried the inscription which was therefore forced into the coin. At first, the movement of the second bar was equal to the circumference of the coin, but later the inscription was split between the two steel bars, and the second bar only moved half the circumference, each bar being responsible for impressing half the inscription. This inscription translates from Latin as "The servant of the coinage", meaning that it serves to protect the coinage (presumably from attempted forgery). It is interesting that the date is included in the edge inscription. We believe this was the first British coin to bear the date on the edge. The head on all the coins of Charles II faces to the right apart from the base metal coins, which have the portrait facing in the opposite direction, to the left. This is unusual because normally all the coins struck for any monarch have his portrait facing in the same direction. Before anybody asks, we do not know the reason for Charles II facing the wrong way on his base metal coins. In the reign of James II, his portrait faces left on all coins, except for the base metal issues on which the portrait faces right. On coins of William and Mary, coins of all denominations and metals have portraits facing to the right. Interestingly, Peck (English Copper, Tin and Bronze Coins in the British Museum) notes this, but states that "For some unknown reason the portraits on all the base metal coinages of William and Mary and William (solus) face in the same direction as in the previous reign - the only instance in which this occurs throughout the entire English copper series." Coins of Cromwell all have their portraits facing the same direction, left, which strangely enough is the same direction as those of Charles I. There is another tradition that with each new reign, the direction in which the monarch faces is changed to be the opposite of that in the preceding reign. There are therefore two factors to bear in mind when considering Peck's statement. He limits himself to considering the portrait direction on base metal as opposed to precious metal coins, but even here his statement is wrong. The few base metal pattern coins issued for Elizabeth I faced in the same direction as the precious metal coinage, similarly for both James I and Charles I. The base metal coins issued for Charles II were, as we have already stated, the first regular issues of regal base metal coinage. The direction anomaly occurs because the designers of these coins, for whatever reason, chose to show the king's head facing in the opposite direction from that on the precious metals. We can only guess that it may have been to prevent forgery through silver or gold plating the base metal coins to pass them off as silver or gold. We are aware that electroplating had not been discovered, but it was possible by other methods to plate base metals. The anomaly persisted into the reign of James II because all coins had their portrait polarity reversed. It was only with the issues of William and Mary that the anomaly was corrected. It is likely that Cromwell chose to face the same direction as his predecessor as a political statement, we do not know. Jumping briefly ahead for about three centuries, it is often stated that George VI chose to retain his portrait facing left as that of his father because he vainly believed his left profile to be his better side. We believe it was simply because the coins prepared for Edward VIII faced correctly to the right, and by reverting to the left as on his father's (George V) coins, he was simply following the tradition of reversing the portrait direction of his predecessor. 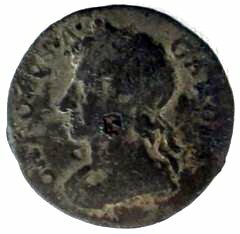 In 1685, production of tin farthings, still with a copper centre plug, was continued for James II, with the addition of copper halfpennies. The reverse designs were identical to the previous ones of Charles II. The obverse design of the halfpennies showed a draped bust of James II, that on the farthings had a cuirassed bust, except for the last year, 1687, when a draped version was introduced, similar to the halfpenny. Under William and Mary, production of tin farthings continued with the same reverse designs, and both bust types, draped and cuirassed. At first, the halfpennies, as previously, carried the date on their edge only. The farthings now carried the date both on the edge and in the exergue (the space below the ground line of the main design), and from 1691, this was adopted for the halfpennies also. We want to buy any tin coins featuring Britannia, particularly in better grades, so that we can display better photographs on this page.